The financial accountant's role begins when transactions post to the ledger and continues through budgeting, financial control, and financial reporting. The accountant's role is literally "keeper of the accounts." "... the process of identifying, measuring, and communicating economic information to permit informed judgments and decisions by users of the information." An accountant is a practitioner of accounting (or accountancy). Accountants in large firms generally fall into three categories. Financial accountants manage, update, correct, and report the firm's accounts to parties outside the firm. The financial accountant, therefore, is literally "keeper of the accounts," hence the name of the profession. Managerial accountants or Cost accountants provide account information to those within the firm. They typically participate in budgeting, forecasting, and analysis of financial problems. Internal auditors monitor the firm's internal controls and check for fraud, waste, and financial mismanagement. "Independent accounting consultants," working either for themselves or consultants," working either for themselves or sometimes for an independent accounting firm. "Government auditors" are public sector employees who review and monitor agencies and other government organizations. Government auditors also monitor private businesses that are subject to government regulation. First, the accountant's role in (1) financial accounting and reporting, (2) managerial accounting (cost accounting), budgeting and planning, and (3) internal control and auditing. Second, educational and background requirements for accounting careers. Third, accounting certifications in different countries. What are the requirements for accountant education, licensure, and certification? See the article Bookkeeper and Bookkeeping for more on the role of bookkeepers in the accounting cycle. Accrual Accounting provides an introduction to basic concepts in financial accounting. The following articles describe the accountant"s role in more detail for specific steps in the accounting cycle. For more on the role of cost accountants in budgeting and variance analysis, see Budget and Budgeting. In a small firm, one or two accountants may perform all of the accounting tasks described in this article. Medium size and large companies, however, usually have different accountants responsible for financial accounting, internal auditing, and cost accounting. Alternatively, many clients. Exhibit 1 below shows the accounting cycle steps that result in published financial reports. Exhibit 1. 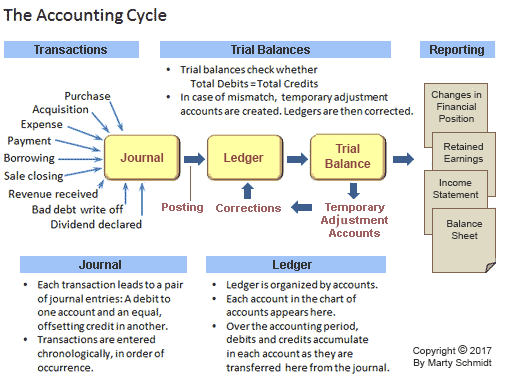 The chart shows steps in the accounting cycle. The accountant's role usually begins when journal transactions post to the ledger. Preparing capital and operating budgets, administering the budget process, and internal reporting of performance against budgets. A cost accountant is the primary "first responder," for instance when the firm must analyze and respond to a severe budget variance. Evaluating manager and business unit performance against business plans and benchmarks. Analyzing and reporting on other financial problems. Managerial accountants in these roles look both forwards and backward in time. They must forecast future budgetary needs while analyzing past financial performance. Internal auditors report to their own firm's board of directors or corporate officers. They are primarily responsible for checking for fraud, waste, and financial mismanagement. However, internal auditors may also monitor the firm's internal controls and its compliance with government regulations. Government auditors are public sector employees who review and monitor agencies and other government organizations. Also, they "monitor" private firms that are subject to government regulation (e.g., banks) and taxation (almost all private businesses). External auditors are outside consultants, hired by private businesses to review their accounting practices and accounting statements. External auditors issue formal opinions on whether or not a firm's accounting practices and financial reports conform to Generally Accepted Accounting Principles. In some small firms, the person performing accounting tasks started as a bookkeeper or in another administrative role, and over time "worked into" the accounting position. Overwhelmingly, however, in government and most private businesses, accounting positions now require at least a bachelor's level college education. "Bachelor's level" usually means a 4-year program, with a degree in accounting, or a degree in business with a concentration in accounting. Some positions require a Master's degree in Business Administration (MBA) with a concentration in accounting. And, many jobs also require certification by a professional accounting organization. Firstly, accountants who sell services to the public. Secondly, those with certain accounting specialties, such as insolvency or taxation. Thirdly, accountants who file reports with governments or government agencies. Accounting positions and roles also typically require professional licensing and certification beyond the bachelor's degree. Note, incidentally, that the best-known accounting credential in most English speaking countries is designated CPA. Note also, however, that "CPA" stands for similar but different terms in each of the four nations mentioned here. In Australia, CPA designation means the accountant has achieved membership in Chartered Practising Accountants, Australia. For this, accountants must first hold a degree from a CPA-recognized educational body. And, they must complete a CPA program including formal coursework and relevant work experience. In Canada, the best-known accounting credential is the CPA, Chartered Professional Accountant. To qualify as a CPA, accountants must have the appropriate formal education and relevant work experience. And, they must receive a passing score on a "Common Final Examination" (CFE). In the United Kingdom, CPA refers to a Certified Practicing Accountant. UK accountants may also be recognized as Chartered Accountants, Chartered Certified Accountants, and still other designations. In the United States, the best-known accounting credential is a Certified Public Accountant (CPA). Individual states administer the certification, each with its requirements for post-university education, examinations, and professional experience. By law, an accountant filing reports with the US Securities and Exchange Commission must be a CPA. Other accounting certifications recognized in the US include the Certified Management Accountant (CMA), Certified Internal Auditor (CIA), and Accredited Business Accountant (ABA). Other English speaking countries use very similar terms for accounting credentials. And, certification in almost all countries requires a recognized formal education, relevant work experience, and a passing score on a comprehensive examination.